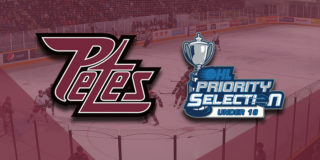 The game kicked off on a high note as the OHL Petes welcomed all eight ‘AAA’ Petes teams to centre ice. The opening period was quiet for 18 minutes until the Steelheads struck the first mark with 2 minutes remaining to take the match 1-0 as Keenan Washkurak buried an Alan Lyszczarczyk. It wasn’t long before the Petes retaliated, and Nick Isaacson found Brady Hinz to tie it at a single point each just before time ran out. The period would end on a 1-1 tie as the Fish held the lead in shots on goal, 15-10. Mississauga would take back the lead early in the second as they scored the opening goal of the period when Washkurak and Lyszczarczyk connected again, with Cole Carter getting in on the power play marker. with 10:35 on the clock Peterborough would find the equalizer once again as captain Zach Gallant, back in action after missing 28 games to an October injury, took a feed from Declan Chisholm and Erik Cermak to mark his return. It was not the last that Mississauga netminder Jacob Ingham would see of the Petes as Nick Robertson fired a rocket courtesy of Chris Paquette to give the Electric City Kids the 3-2 lead going into single digits remaining in the middle frame. Without giving Ingham much of a chance to breathe, the home team increased their lead to 4-2 with a Liam Kirk shot which found Cameron Butler, allowing the Petes to take their first lead of the evening. The Steelheads would drop Peterborough’s lead back to one goal as Carter and Thomas Harley rocked the puck to Lyszczarczyk, allowing him to rifle it past Hunter Jones on a man advantage before the end of the frame. Shots on goal were 37-32 in favor of Peterborough, with Peterborough sending 27 shots to the Mississauga net in the second stanza. The final period would be punctuated by an early Peterborough goal which came from the combined efforts of Adam Timleck, Robertson, and Paquette to make it 5-3 in favour of the hometown boys just two minutes into the frame. The Fish struck back to once again get within a single goal as Harley and Liam Ham assisted Cole Schwindt on the power play to put the score at 5-4. Lyszczarczyk would score once more at 1:20 assisted by Schwindt to send the game to overtime. 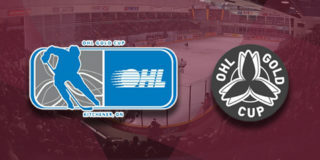 Despite an OT power play opportunity for the Petes, neither club would score in the overtime period, forcing the teams into their second shootout situation in five days. 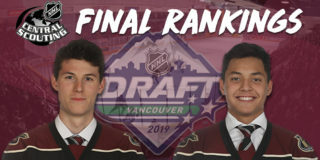 In the end, the Petes would drop their first home game of 2019 6-5 to Mississauga. Final shots finished 47-44 in favour of the Petes. Lyszczarczyk, Paquette, and Gallantwere named the game’s first, second, and third stars, while Jones was named the Mark’s Hardest Working Player of the Game. 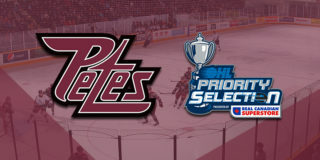 The Petes are on the road in Kingston on Friday, January 4 at 7:00pm and in Mississauga on Sunday, January 6 at 2:00pm. They’re back on PMC ice for a three-game homestand, starting with the rival Oshawa Generals at on Thursday, January 10th at 7:05pm.